Director Shankar's movie 2.0 (Robot 2.o) starring Rajinikanth, Akshay Kumar and Amy Jackson has received rave reviews and rich ratings from the Telugu film critics. The Telugu critics have been carried away by the visionary filmmaking of director Shankar and Rajni aka Rajinikanth, Akshay Kumar and Amy Jackson's brilliant performances and world-class production elements in 2.0 (Robot 2.o). Set in Chennai, 2.0 is about the disappearance of mobiles phones caused by deadly bird Pakshi Raju (Akshay Kumar). The clueless government orders Vaseegaran (Rajinikanth) deal with the bird. To his suprise, Pakshi Raju kills Chitti and Vasi creates a new version of Chitti to fight against Pakshi Raju. How the 2.0 Chitti fights Pakshi Raju forms the rest of the story. The Telugu critics say that Shankar has chosen a genuine subject with a social message for 2.0. The director has not only imagined something really different but also successful in making it a visual spectacle. You might find it predictable in part, but the movie is quite engaging and entertaining from the beginning till end. 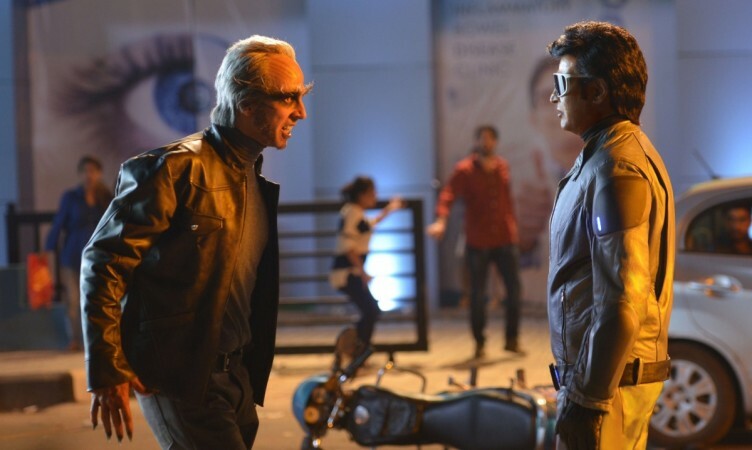 Rajinikanth, Akshay Kumar and Amy Jackson have delivered brilliant performances, which are highlights of 2.0. Having superb production design, the movie is packed with a technical brilliance and AR Rahman's background score, master-class camera work, lavish sets. The VFX works in the title cards and climax are mind-blowing, say the Telugu critics. 2.0 is a visual extravaganza which makes you go wow in every which way. Be it the international level VFX, the action thrills between Rajini and Akshay, lavish sets and amazing action, this films is one hell of an experience for the viewers. The film has a very universal theme and will be liked all over the country and break several records in the south. Barring the same old good vs evil concept and Akshay Kumar's flashback, 2.0 is one film which should only be experienced on the big screen as scientific thrillers like these are very rarely made. What are you waiting for just book your tickets and watch the film with your family and have a whale of a time. 2.0 offers lots of Goosebumps moments in the second half with some thrilling episodes, an emotional backstory and offers typical popcorn entertainment with stunning visuals, scintillating cinematography, colorful songs, apt casting and to top it all, the Superstar Rajinikanth in top form delivering mass plus class entertainment at its best. All said 2.0 is the perfect sequel to Endhiran and delivers more than what it promised. Director Shankar is known for making a social backdrop stories and add technology to it, but here to the contrary he takes technology as backdrop and then give social backdrop is to be appreciated. A need of the hour story made with two superstars of Indian cinema by a visionary director is what brings people to theatres and they give us a film to watch happily this weekend. Shankar and team delivered a Box-office winner in the form of '2.0'. First half is average , second half is good AND last 30 minutes pure VFX Extravaganza ! Story wise not much to rave about , Shankar's mark in effectiveness or Emotional connect has been limited to Pakshi Raja ( Akshay ) ' s flashback and that episode is the soul of the movie.